A parliamentary report of 1776 listed listed three parish workhouses operating in Hastings: All Saints (with accommodation for 30 inmates), St Clement (60), and St Mary of the Castle (20). County of Sussex: Fairlight, Guestling, Hastings All Saints (3), Hastings Holy Trinity, Hastings St Andrew, Hastings St Clements (3), Hastings St Leonards, Hastings St Mary Bulverhithe, Hastings St Mary-in-the-Castle (2), Hastings St Mary Magdalen, Hastings St Michael, Ore, Pett. The population falling within the Union at the 1831 census had been 13,280 with parishes ranging in size from Hastings St Andrew (population 3) to Hastings All Saints (3,111). The average annual poor-rate expenditure for the period 1831-34 had been £6,969 or 10s.6d. per head of the population. The new Hastings Union Board of Guardians held their first meeting on 22nd July 1835 in the former parish workhouse of All Saints off Old London Road. For its immediate needs, the Union continued to use two existing parish workhouses, with able-bodied paupers at All Saints and the aged and infirm at St Clements. A new Hastings Union workhouse was built in 1836-7 on a site at the east side of Cackle Street (now Frederick Road) in Hastings. It was ready to receive its first inmates on 10th July 1837, with 160 paupers being transferred from the old parish workhouses in the Union: 10 from All Saints, 14 from Fairlight, 32 from Guestling, 2 from Holy Trinity, 5 from Pett, 43 from St Clements, 7 from St Leonard's, 16 from St Mary in the Castle, and 3 from St Mary Magdalen. The new building was designed by Sampson Kempthorne and Annesley Voysey and followed Kempthorne's model cruciform or "square" plan. Designed to accommodate 300 inmates, the Poor Law Commissioners authorized an expenditure of £5,286 on its construction. The workhouse location and layout are shown on the 1873 OS map. The view below dates from the early 1900s. Hastings from the south-east, early 1900s. A three-storey entrance block lay at the south of the site. 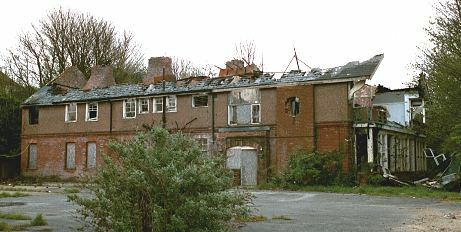 Hastings entrance block from the south-west, 2001. To the rear, four accommodation wings radiated from an octagonal hub from which each of the inmates yards could be observed. Hastings south and east wings from the south-east, early 1900s. Hastings west and south wings from the south east, 2001. A long two-storey pavilion-style infirmary block at the east of the site ran along Cackle Street. Hastings pavilion block from the north-west, 2001. In 1892, the Hastings Guardians held a competition for the design of a large new workhouse to be built on the opposite side of Cackle Street. The grandiose winning design by P.H.Tree of St Leonards featured entrance buildings, a large pavilion-block main complex, a large chapel, and a separate infirmary to the west. An architect's birds-eye view of he proposed scheme is shown below. Hastings proposed new workhouse from the south-east, 1892. However, the original project stalled and in 1899 work started on a much less ambitious (and cheaper) scheme designed by Alfred W Jeffery and William Skiller. The foundation stone was laid on 5th April 1900 by Alderman Frederick Tuppenney, after whom Cackle Street was renamed Frederick Road in 1904. The new building was declared open on 22nd April, 1903, but remained empty for public viewing. Admission was by ticket only and some visitors were accompanied on their tour by the Master, Mr Merryweather, and the Matron, Miss Brown. 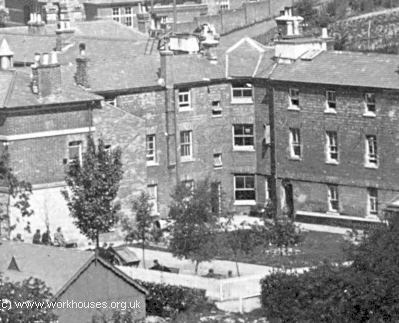 Hastings new workhouse from the south-east, early 1900s. The new workhouse had a central administrative block containing the workhouse Master's and Medical Officer's quarters, dining hall, kitchen and stores. Hastings new workhouse administrative block from the south-east, early 1900s. The administrative blocked was flanked by two three-storey dormitory blocks, one for mean and one for women, each housing 171 inmates. There was an entrance block with vagrants' cells towards the road at the east of the site. A chapel stood at the south of the site — in the picture below, large tents cane be seen between the chapel and the main building. Hastings new workhouse chapel from the south-east, early 1900s. The old workhouse infirmary was retained in use and a 240-yard long subway connected the two sites. The old and new workhouses are shown on the 1928 map. 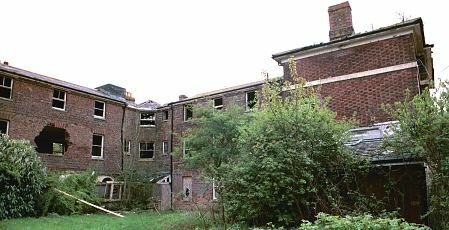 In around 1909, a new nurses' home was erected to the east of the old workhouse. 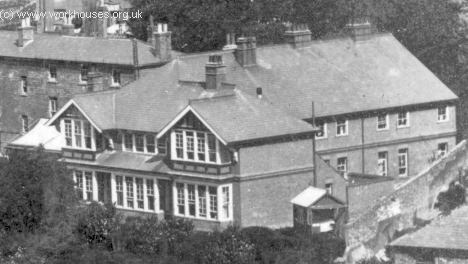 Hastings nurses' home from the south-east, early 1900s. 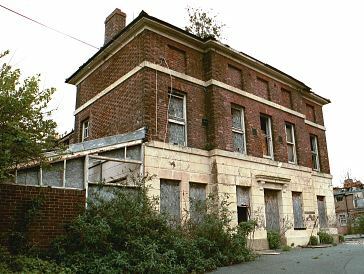 Hastings nurses' home from the west, 2001. Hastings workhouse has become associated with the name of the novelist Catherine Cookson (1906-1998). Born into a poor family at Tyne Dock in South Shields, Catherine left school because of ill health before she was thirteen and followed her mother into domestic service. However, she began to try and educate herself through reading and night classes. At the age of 18, she obtained a job in the workhouse laundry at Harton in South Shields. After taking a more senior post at Tendring workhouse in Essex, she arrived at Hastings in 1929 to become head laundress, vowing she would "never, never go back". 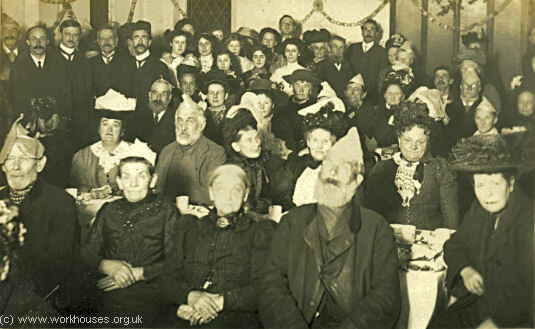 Hastings workhouse Christmas party, date unknown. 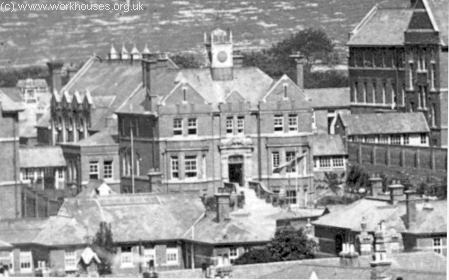 In 1930, the workhouse was renamed Hastings Municipal Hospital, then after the introduction of the National Health Service in 1948 it became St Helen's Hospital. St Helen's closed in 1994 and the 1903 buildings have now all been demolished and replaced by a housing development whose road include Cookson Gardens (after Catherine Cookson), Ticehurst Close (after Frederick Ticehurst, one of the union medical officers five-times mayor of Hastings), and Tuppenney Close (after Frederick Tuppenney, Chairman of the Guardians from 1889 until his death in 1910, and three-times mayor of Hastings). Much of the 1837 building survives and, after a period of standing semi-derelict, has recently been refurbished for residential use. 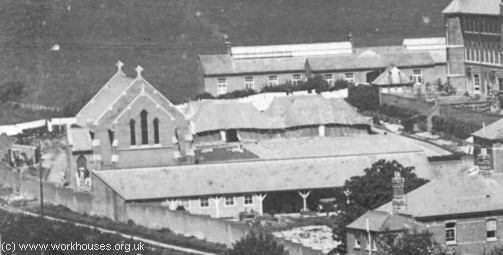 Hastings old and new workhouse from the south-east, early 1900s. Hastings new workhouse from the south, c.1910. By the early 1900s, the Hastings Union had established a number of children's scattered homes in Hastings. In 1908, the premises in use were at 100 Ashburnham Road and 59 Vicarage Road. In 1924, the list comprised 59 Vicarage Road, 65 & 121 Mount Pleasant Road, and 14 Edmund Road. A house at 11 Wellington Square was also used for a time. The homes each accommodated around a dozen children under the care of a house parent. East Sussex Record Office, The Keep, Woollards Way, Brighton, BN1 9BP. Holdings comprise: Guardians' minutes (1835-1930); Admissions and discharges (1878-1930); Births (1893-1930); Deaths (1866-1930); Creed registers (1877-1930); Plans (1879-1903). Gilbert, John (2003) article on Frederick Tuppenney and his Hastings Union work in Hastings Bygones 5, p.56-59.